I read an intersting article by Máirín Duffy about how she introduced Inkscape to a middle school. It includes a number of valuable tips that might come in handy for a freedroidz workshop or something similar. I read a blog post about a nice work shop at a university in Canada to teach students how to participate in Free Software projects. One of the comments led me to a similar project in Granada. Do you know any other activities in this direction in Europe? The posting also links to another project that aims to help people interested in contributing to Free Software, but don’t know where to start: openhatch.org. Not the latest, but still interesting documents for developers might be the quality criteria for e-learning in Austria. (via Bildungsserver.de in German) Even if teachers would only have to choose among Free Software tools, they face a mass of software. And they can’t try it all before using it. I guess they are likely to pick something recommended by professionals. So, knowing the criteria might help improving free educational software. 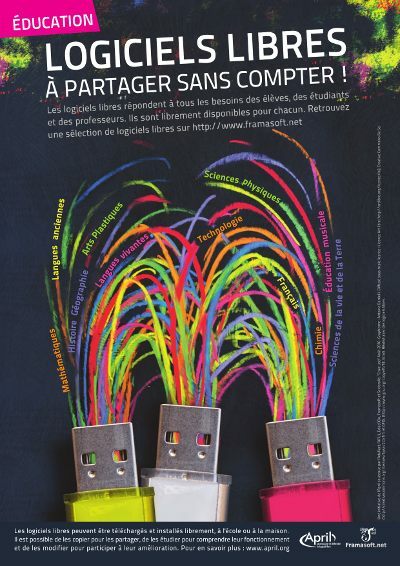 les logiciels libres : à partager sans compter ! The edu folks from April created a colourful poster to promote Free Software in education and published it under various free (as in freedom) licenses. As I read in the tarent blog, a student who participated in one of the freedroidz work shops, wrote a report about it (German). The Department of Education in Valencia has created a software package installation for easy download of over 200 educational resources offered by LliureX for Kids version 10.09. (via OSOR). It was first presented at the Fourth Congress of Free Software. The collection of news entries about Russia grew remarkably in our wiki. The latest entry (German) is that there’s a new release of the edu version of ALT Linux, a governmental edu distribution.